If you’ve been told that you just have to “live with” osteoporosis or osteopenia, choke down drugs that risk dangerous side effects, and give up your lifestyle and mobility, they couldn’t be more wrong. 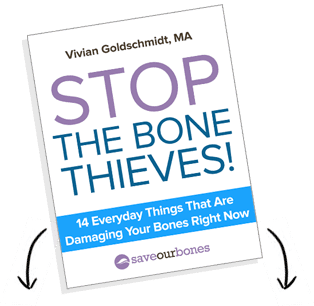 My name is Vivian Goldshmidt and I’ve helped thousands of sufferers with osteoporosis naturally increase their bone density without pills, pain, or cost. … And I’d like to do the same for you. In fact, for a very limited time I’d like to give you my eBook ‘Stop The Bone Thieves’ 100% FREE. No credit card needed. The shocking truth about osteoporosis and how you’ve been lied to by the medical establishment. The dealer secret that forces doctors to hand out dangerous osteoporosis drugs even though you don’t need them (and even though they’re eating your bones alive). How you can naturally “feed” your bones and fill in the “holes” in them like pouring pancake batter into a waffle maker. Just enter your first name and email below and the FREE eBook will be instantly emailed to you. You’ll also receive free important osteoporosis updates from Vivian. Click Here to Request Your Osteoporosis Report Today and Receive it Immediately! WARNING: What you learn in this eBook may SHOCK you, may DISTURB you and may even make you MAD. But I personally GUARANTEE that it will fundamentally alter the way you look at osteoporosis. Click Here – It’s FREE!